It's getting harder and harder to think of new ways to incorporate the word "Wang" into the opening paragraph of news stories about Shadow Warrior 2 trailers—in this case, a full 15 minutes of footage. I guess I could ask if you want to stick some Wang in your eyes and ears? No, that'd be weird. Stare fixated at more Wang? Hmm, possibly. Drool insatiably at the prospect of getting your hands on Wang? Yeah, that'll do. 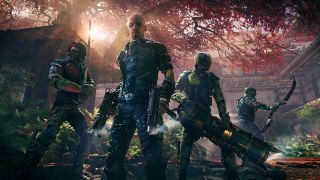 Shadow Warrior 2 is out next year, so that's how long you'll have to wait before your grubby mitts are back on that Wang.